Parents often let their children play in their phones or tablets, one man was shocked when he gave his iPad to his three year old kid. 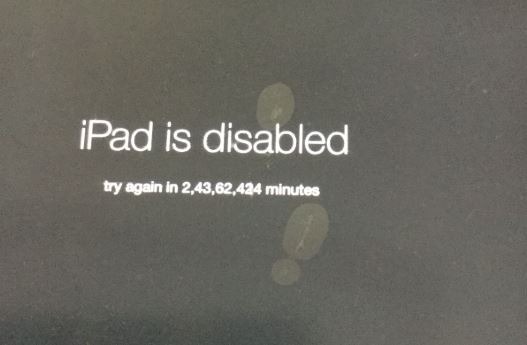 A journalist from Washington DC, Evan Osnos got locked out of his iPad for 25 million minutes after his son repeatedly tried to unlock the device. To put that into human time frames, 25 million minutes equals 47.5 years. The worried journalists, Mr. Osnos reached out on Twitter to ask his followers for ideas. His tweet got some hilarious replies. The standard procedure to gain access to a locked iPhone or iPad, was disabling the passcode. If a user has back up data, then it would restore the data and settings if not the data would be lost. Connect the iPad to your system, and open iTunes. While the device is connected you should force restart it. Then, the computer would ask if you’d like to Restore or Update the device, choose Restore, and iTunes will download software into your device. Once that’s finished your device should be up and running once again.